The government is attempting to change the way MPs make laws to reflect the fact that the Scottish Parliament at Holyrood is getting more power. It is trying to solve a problem that has dogged Westminster for decades - why should Scottish (and sometimes Welsh and Northern Irish MPs) get a say over laws that only affect England when English MPs no longer have a say over an increasing tranche of areas - like schools. The solution it has come up with is a complex one, to anyone not steeped in the arcane procedures of the House of Commons. And it is attracting criticism from all sides. Here's what is going on and why it matters. When Scotland voted last year to remain part of the UK, David Cameron promised significantly increased powers for the Scottish Parliament, including the ability to set some tax and benefit levels. At the same time, he promised English MPs they would get more power too - they would be able to legislate in areas such as health and education without any input from MPs representing Scottish seats. He called it "English Votes for English Laws", which got shortened to EVEL. Getting the balance of power between the different legislative bodies right is seen as important to the future of the UK. If the Westminster Parliament is going to have any authority, voters from all parts of the country must feel they are being fairly represented. Why not just set up an English Parliament? This is what the SNP - who are firmly opposed to EVEL - claim the government is trying to do, in all but name. They claim the current plans will just make their MPs at Westminster "second class" citizens. Some argue that an English Parliament would strengthen the SNP's case for an independent Scotland, further weakening the ties that bind the UK together. That has not stopped many Conservative MPs, who are in favour of the Union, calling for one to be set up to curb the power of Scottish MPs at Westminster. The government is against an English Parliament - and it has come up with a formula it hopes will keep English and Scottish MPs happy. It is a big ask. So how will it work exactly? All laws passed at Westminster will, in theory, continue to have the backing of the majority of MPs, just as they do now. But an extra stage will be introduced in the middle of the law-making process, allowing English MPs to block anything they don't like the look of in bills deemed to be "England only". 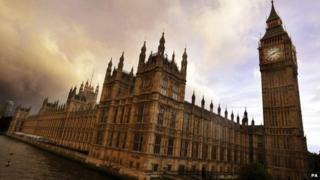 The government will give English MPs a new "veto" over laws that only affect England. In some cases it will be MPs from England and Wales who will get a say on laws not affecting Scotland or Northern Ireland. Under the government's proposals, an England-only committee stage will consider bills deemed "England-only in their entirety", while agreement of a "Legislative Grand Committee" will be required for individual parts of legislation that relate only to England or England and Wales. All MPs will vote on the other stages of the bill's journey through Parliament. How many England-only laws are there? Quite a lot. The Scottish Parliament already has control over the NHS, education, criminal law, housing and economic development, with further powers on the way. The Welsh Assembly has power over health and education, with more to come. Northern Ireland can set its own laws in a whole range of areas, although it often adopts version of English laws. The picture becomes even more murky when you consider laws that are, on the face of it, England, or England and Wales, only but have knock-on effects in Scotland and the other devolved nations. If you want to get into this aspect in more detail, the McKay Commission looked into the whole issue. Image caption Was spending on the 2012 Olympics for England, or the United Kingdom? There are also funding implications for Scotland, Wales and Northern Ireland when a spending commitment is made for England only, for example on the NHS. Under the current Barnett formula grant system, the devolved administrations' funding is adjusted to take into account changes to public spending in England. This is often controversial, for example when spending on the London Olympics was deemed to be UK-wide, rather than England-only - triggering a row between Westminster and the devolved administrations. For these reasons, according to House of Commons Library research, it is "not a simple matter" to count England-only bills. However, it adds that "whatever method is used, there are relatively few bills that unambiguously affect England only". That's not the end of the matter though. There could be sections of a bill that apply only in England, even when the legislation itself extends across the United Kingdom. The government says it will be for the Commons Speaker to decide whether a bill, or sections of a bill, apply only to England, or only to England and Wales. In practice, civil servants will make a recommendation and Speaker John Bercow will abide by it. There are bound to be exceptions when one side or the other feels it is getting a raw deal - meaning the Mr Bercow could be dragged into political rows. The SNP claims this will "politicize" the Speaker - he is meant to be above party political point scoring - but Commons leader Chris Grayling insists he is up to the job of being impartial and it won't be that different to the kind of judgements he is expected to make already. What is Labour saying about all this? Labour has previously called for a "constitutional convention" to consider the issue, and has accused the Conservatives of "rushing" a decision that will enact "profound constitutional change". Since the plans were last debated, Labour has elected a new leader, Jeremy Corbyn, but remains opposed to the proposals. Shadow Commons leader Chris Bryant says Labour backs "an English voice in Parliament" but does not want "an English veto". The plans as they stand will "create two tiers of MPs which will threaten the union and set England against Scotland," he added. Under its previous leadership, the opposition called for devolution within England to regions and for the House of Lords to be replaced with a "Senate of the Nations and the Regions". The 'Northern Powerhouse' has become one of the new Conservative government's most-used slogans. It refers to the transfer of power and funding to northern cities from Westminster to northern cities and city regions, with Greater Manchester at the forefront. In exchange, the government wants to see more directly-elected mayors in charge of these areas. But creating extra tiers of government has not proved popular with the English public. When 10 cities held a referendum on whether they wanted elected mayors in 2012, only one - Bristol - voted in favour. Similarly, voters in north-east England rejected setting up a regional assembly by 78% to 22% in 2004. What about Northern Ireland and Wales? In Northern Ireland, the DUP says a vote on the future constitutional arrangement is not needed, with First Minister Peter Robinson saying "more and more" people want to maintain the status quo. But Sinn Fein says Stormont should get more powers over taxation and government spending. In Wales, Labour First Minister Carwyn Jones demanded a full say in any devolution talks, while Plaid Cymru leader Leanne Wood says Wales must get new powers if Scotland does, rather than being treated as "second-rate".